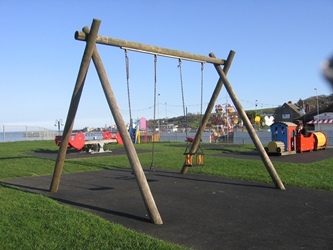 The Recreation Ground can be accessed from either Shore Road, Victoria Avenue or Horsecliff Lane. A children’s play area can be found here, as well as the Santa Fe children’s play park and crazy golf, enjoyed by young and old alike. The Recreation ground is also home to the Town’s War Memorial commemorating all the brave local men who lost their lives in the 1st and 2nd World Wars. The Bandstand is another feature but sadly, little used these days. Mermond Place car park is situated behind the Recreation Ground, together with the resident’s car park which runs adjacent to Horsecliff Road. These are both pay and display car parks, please click here for the current car park charges.